Diamonds may be a girls’ best friend but pearls have inspired people for ages with their classic appeal. People are drawn to pearls just as they are drawn to other people because of their rarity and beauty. While most young ladies are trapped by conformity, Strands of Pearls for The Girls wraps you with courage and allows your astonishing appeal to stand out. In Strands of Pearls for The Girls, RJ Jackson, The Courage Giver places a strand of pearls around the neck and heart of teenage girls to enhance their inner beauty and compliment their outer beauty. Strands of Pearls for The Girls inspires teen girls to live out of their greatness as a precious gem. The conference tour is designed to provide teen girls with the tools to build healthy relationships and self worth in a emotionally safe environment and is open for teen girls 13 -17. Statistics record that 3 in 10 teen American girls will get pregnant at least once before age 20. That’s nearly 750,000 teen pregnancies every year. Doesn’t that simply break your heart? Parenthood is the leading reason that teen girls drop out of school. More than 50% of teen mothers never graduate from high school. Having conducted programs in four different school districts for teen parents, I can attest to these sad and heartbreaking facts. Just one teen girl becoming pregnant is heart wrenching, let alone 750,000 a year. What do you say, we work together to decrease those numbers. Each one reach one, yes, saving one is worth it all. I am committed to reaching 1000 girls with the truth of who they are! Knowing who they are, the plans and purpose that God has for them increases the chance of them making healthy decisions. Please join me in supporting teen girls and teen moms make healthy choices. 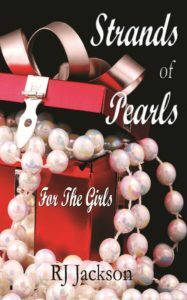 Our efforts include placing a Strand of Pearl around their heart and the book Strands of Pearls for The Girls, a book on confidence, character, values, relationships, faith, and much more, in their hand. Your gift of $16.00 wraps a strand of pearls around a girls heart for life in addition to a book and a workshop ticket for the Strands of Pearls Tour in Southern California. A Strand of Pearls for the Girls is more than a good read, it is the road map for a girl’s journey of greatness. Best Suited for Teens – Young Adults – 13 – 21. YES RJ, I will Sponsor a Teen Girl or maybe two! It would be my honor to support you! Thank you for giving a girl a strand of pearls.